At first glance you feel so sorry for Beau ~ he walks with some difficulty and shaking, but once you get to know this happy, affectionate boy you realize how precious he is and that he truly has quality life. Beau is a senior at approximately nine years old who came in with a raging ear infection and obvious issues to his spine and/or rear legs. Immediate vet counsel, testing and x-rays indicate that at some time in his earlier life Beau suffered a traumatic spinal injury. 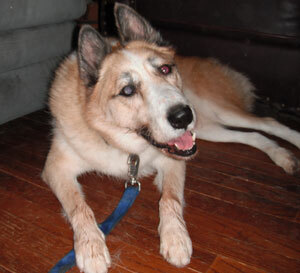 Our first reaction was to feel sorry for Beau ~ until we got to know this magnificent dog. He may look shaky, but his will is strong. Beau is happy to be alive ~ and we are happy too. Beau is settling in with his foster family and making friends. He is happiest when he can crawl into a lap and settle in. Beau is a welcome addition to the MaPaw family and will be a permanent resident with us due to his physical limitations ~ but don’t tell Beau that, he is happy and spoiled! Beau continues to do well and enjoys the company of the other dogs in his foster home. He loves to cuddle, go for short walks and just hang out with the family. He continues to be a happy boy and we couldn’t ask for anything more.